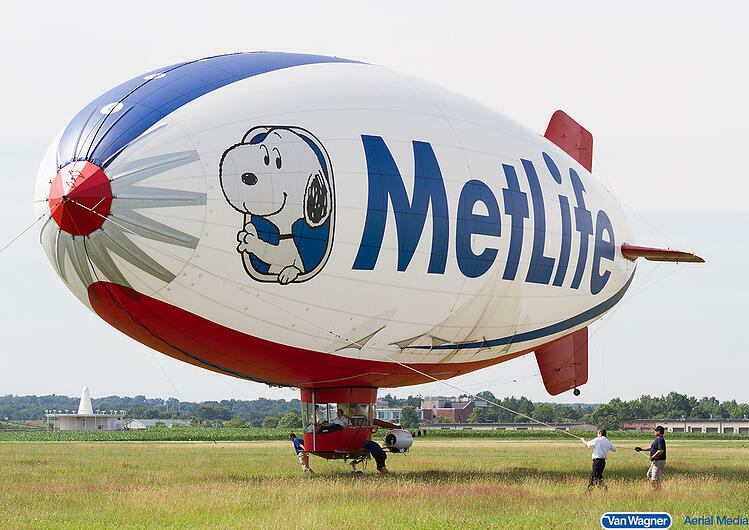 Why do brands choose blimp advertising? Consumers see over 5,000 advertisements a day, and aerial advertising allows ads to break free from all the clutter on the ground below. 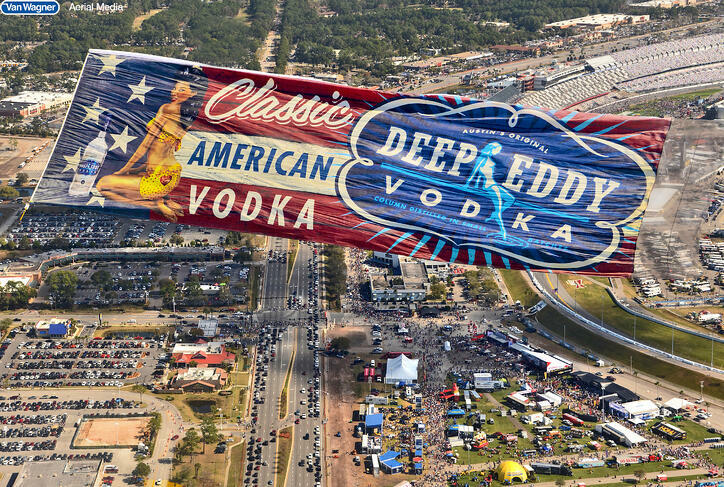 Airplane banners are a top choice for local, regional, and national marketing managers looking to get noticed above high-profile events and areas with a lot of foot traffic. These conspicuous floating billboards are commonly seen flying over beaches, music festivals, and sporting events like NFL, MLB, and NASCAR. Why do brands choose aerial banner advertising? When executed properly, these eye-catching, outdoor marketing campaigns offer publicity and media coverage that is second to none. Their portability enables marketers to fly banners in the top DMAs across the country for a fraction of the cost of traditional outdoor campaigns. Consumers are tuning-out advertising messages all around them. As of 2008, 28 million households in the United States used DVR. Goodbye, TV ads. Radio is encountering the same problem with new ad-free or ad-reduced, radio streaming companies like Sirius, Pandora, and Spotify. We are also sad to report that print advertising is becoming more and more obsolete. In order to reach consumers, advertisers need to put their messages right in front of them. That’s where aerial banners come in. Aerial banner advertising has been around for almost a century, and although we have had improvements in banner materials and towing-technologies, the concept for the most part has stayed the same. Why? Because it works. People are naturally-programmed to look up when they hear something flying overhead. Depending on the size of the crowd below, airplane banners are capable of garnering tens of thousands of impressions with one single flight. 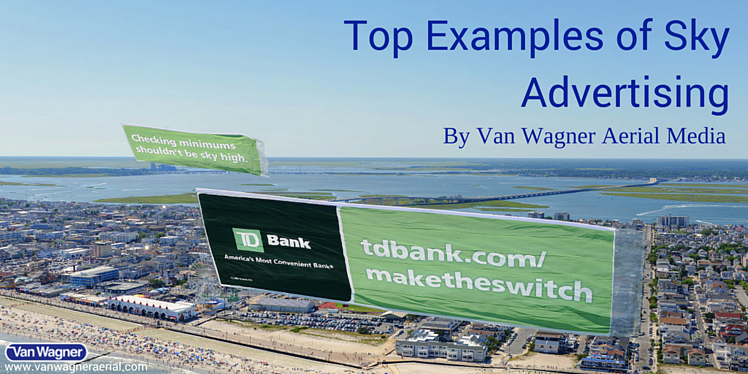 Plus, with the right copy, aerial banners create social media buzz that amplify impressions exponentially. Sky Writing is when a single plane performs a series of loops to create a message, typically one or two words, in the sky above. Sky Typing is a little bit more complex. A group of planes fly in a staggered formation while ejecting small puffs of environmentally-friendly smoke from the plane's exhaust creating a dot matrix in the sky above. The matrix spells out letters which eventually create a message. Typically, messages are somewhere between one to four words long. The dot matrix is pre-determined by a computer prior to flight. Why do brands choose sky writing/ sky typing? People are fascinated by sky writing and sky typing. It captivates consumers on the ground below and stimulates their imagination. It has people asking their neighbors, “What do you think it’s going to say?” Advertisers love sky writing/ sky typing because they can target an audience anywhere and these types of messages usually create a huge media frenzy. 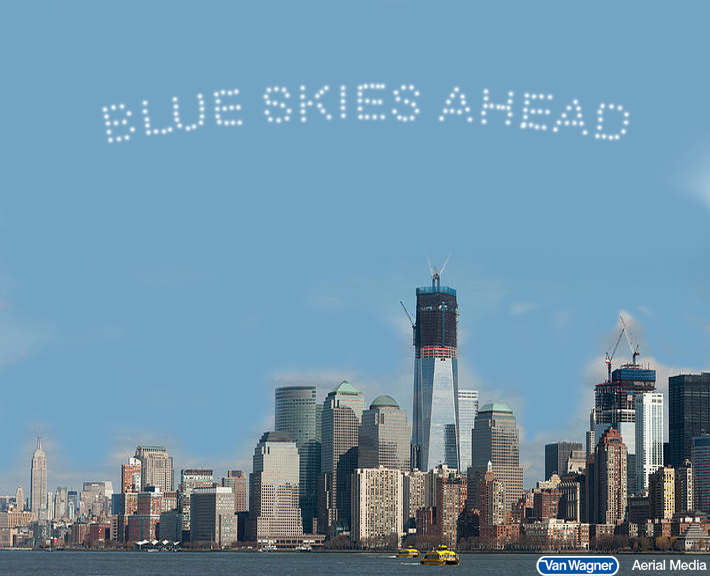 With sky typing, messages can span for multiple city blocks and stand at a height of over 1,000 feet. What it really boils down to, is the fact that sky writing/ sky typing give brands the freedom to directly target large audiences with relatively small investment when compared to traditional media. It is also a form of guerilla marketing that makes a BIG impact. If you are looking to get people talking, sky writing/ sky typing is a definite must. Hot air balloons are most commonly used for consumer rides and advertising purposes. They come in a variety of shapes and sizes and are considered the oldest successful human-carrying flight technology. Why do brands choose hot air balloon advertising? Standing at approximately 75-85 feet tall and dwarfing most conventional billboards, hot air balloons present a unique sky advertising opportunity. These graceful floating sky advertisements have been aweing the imagination of spectators on the ground below for well over a century. Brands choose hot air balloon advertisements because they are highly-visible, buzz-worthy, and they elevate the brand both literally and from a business prospective. If you would like more information about hot air balloon advertising or any of our other aerial advertising capabilities, contact Van Wagner Aerial Media today or click below for a free quote.